you voted the next article up to MV during the last couple of days. 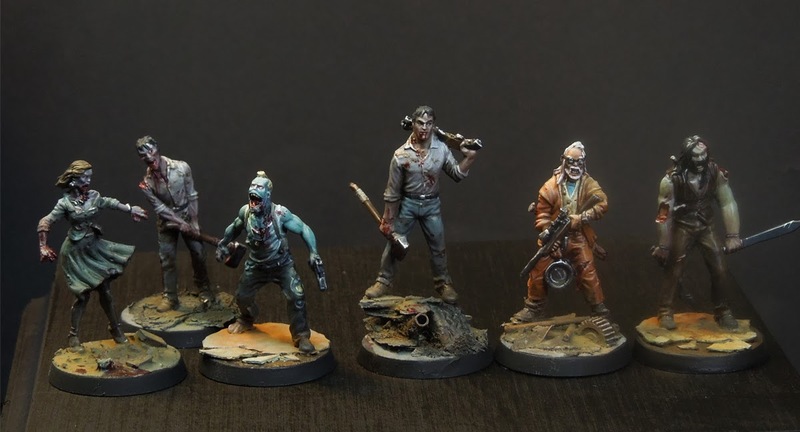 Your decision went to Zombies from CMON's Zombicide Game. So not for the bowstrings this time, but maybe on the next public vote? 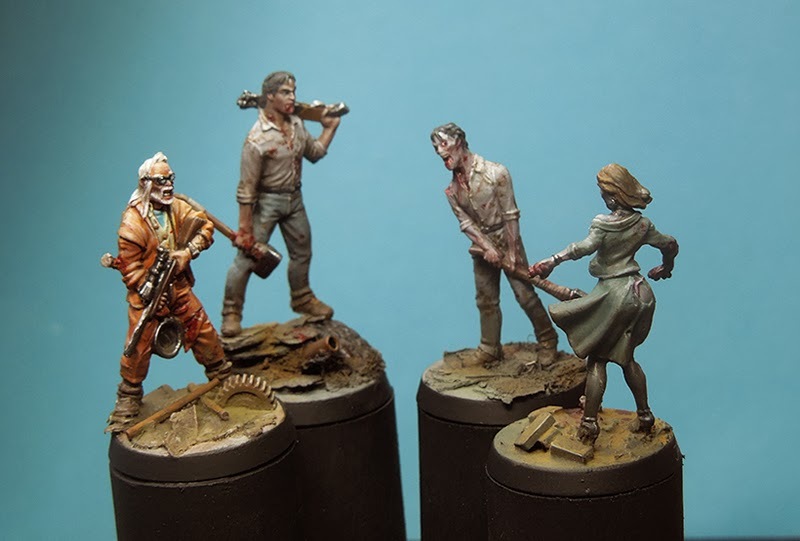 A little introduction in why I did paint these figures like I did. Sometimes, beside bigger projects I am in need of a quick paintjob. Something to free the mind, something that does not take ages to be finished, a quick happy painting joy projected to one figure. 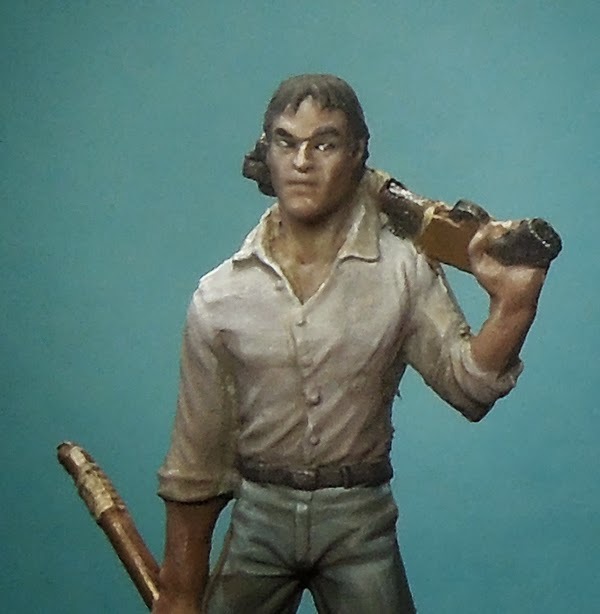 I did not spent an ultralong amount of preparing the plastic figure at all. 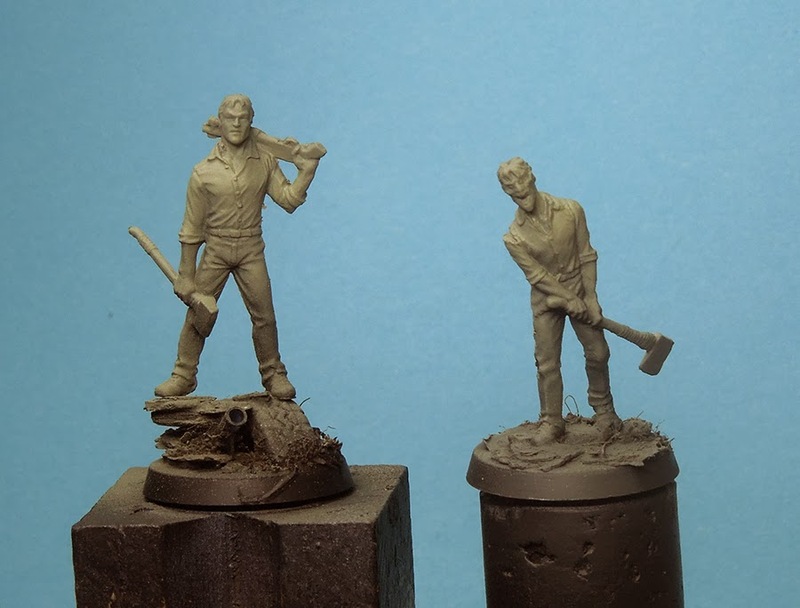 Did the basics and started priming the figures. The bases have been done pretty quick also. I used some pieces from my collection of material, soil and pieces of dry Milliput. I am showing my progress on the figure only on two models of the game. I did paint some more as you can see above and on some you will find even quicker bases. I show and explain to you later on. So far and now let's head over to the priming. I did prime the models with black GW primer. On the photos you can see the bases are not yet primed. Honestly, when I try to remember back I have no idea what happened there. 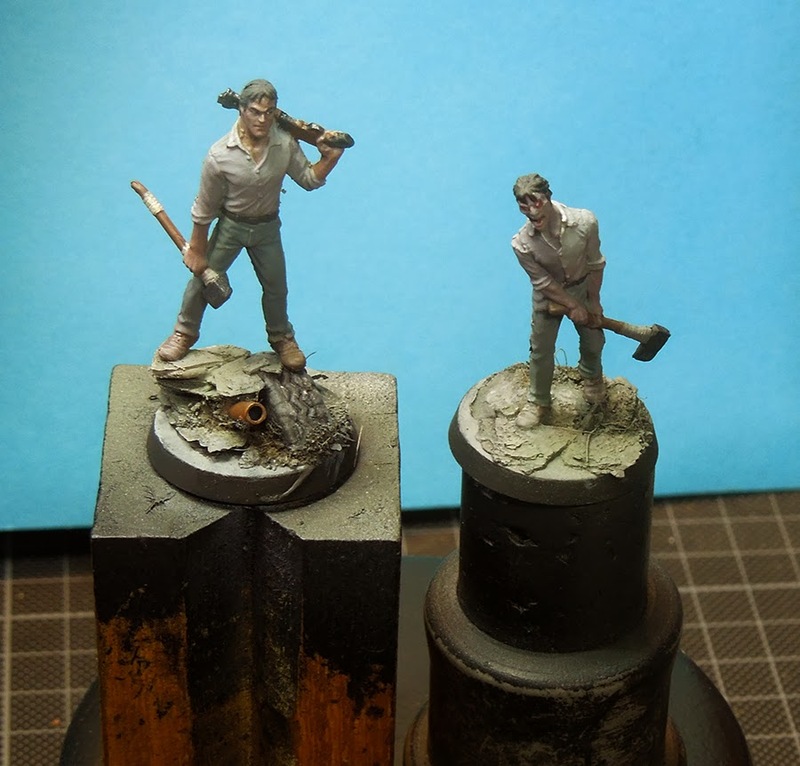 I guess perhaps I was planning to paint the figures without a base first and did build the base afterwards. Well, happens when you are in the flow of happy painting, eh? 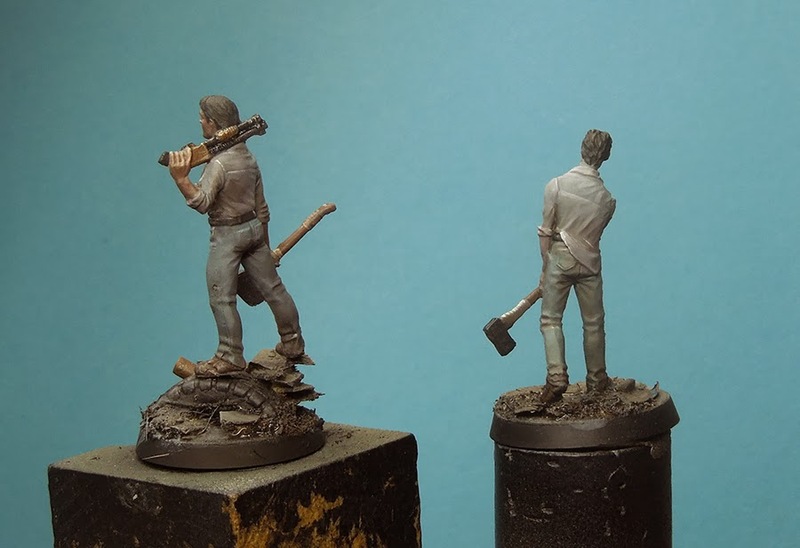 In fact it is a good chance to have a closer look on the bases before they will go black too. The base on the left side got the materials in it I explained to you above. The one on the right in particular is maybe pretty interesting at it was done ultrasimple. 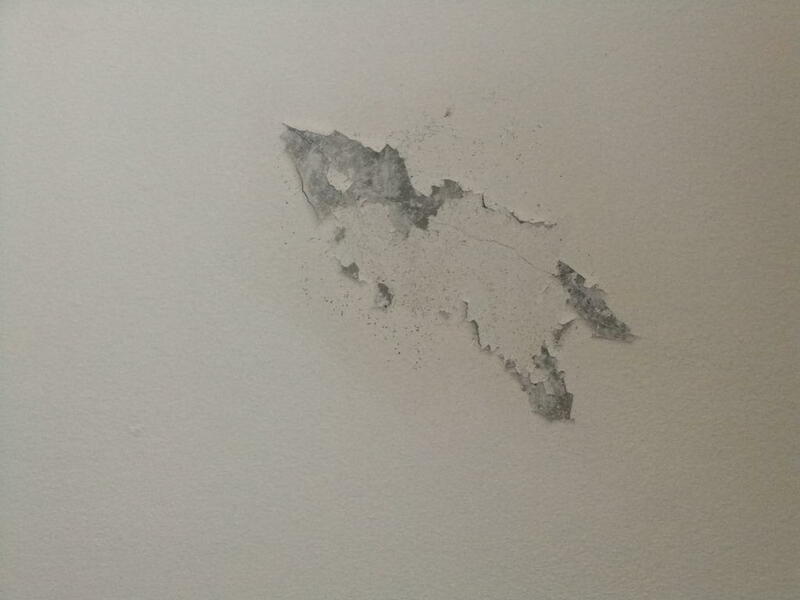 In our studio you can find many walls with finery slowly falling off from the wall, which looks like this. I just ripped off a little bit of it - you don't need much - and glued it to the plastic base with superglue. Some soil here and there and the everlasting pleasure of a cool gaming base is yours. Not too fency, ultrasimple but effective - exactly what I am aiming for. 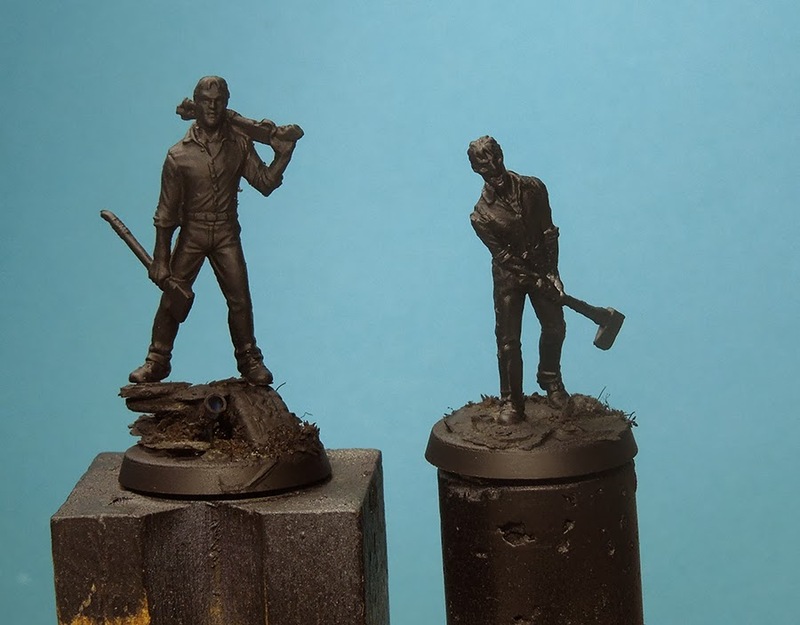 I glued the figures to their bases by just the use of superglue. No pins here. On the left Base you can see that I got to put more soil to the figures right leg to make it more balanced on the base and give it a good stance. While the work on the models is a little time back I hope I did. Next step is again a simple one. I decided other basic colours and applied them, again I aimed for a good opacity. I ended up with two layers for each basic tone, applied with the brush. 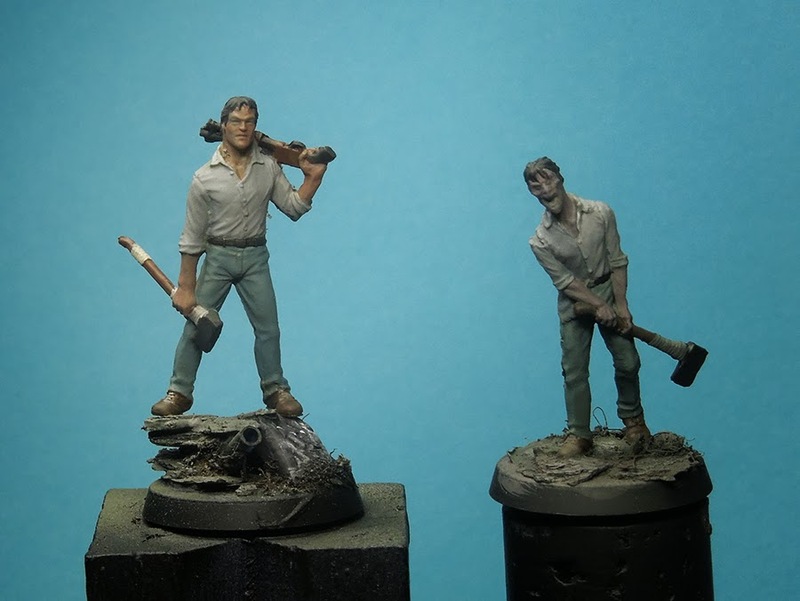 You can see I kept the basic tone from the early airbrush work mainly for the bases, but somehow all other tones have a little mood of the greenish grey inside - or is it just me who sees that? Next step was adding basic tones to more detailed areas for example the eyes. Following photo looks a little warmer due a yellow lamp I guess ... sorry for the little temperature change. You can see the small changes on the eyes. Zombie recieved white eyes while the other dude got black ones and eyebrows. 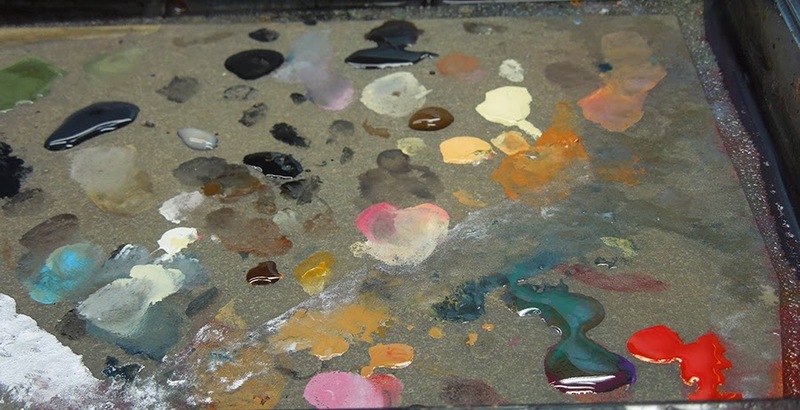 Additional to that I show you the look of my wetpalette during such intense painting sessions. A lot of things going on and I just pick what I need. Plow! Plow! You can also see a little sketch of mostly pure white to the upper areas of both their shirts. Kind of strong edge highlights, just a sketch for me where I want to the have the strongest light in the end by using the advantages of zenithal light painting. 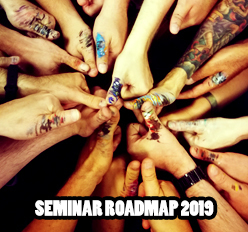 Ok, next step is still pretty small. I added a red glaze to the white eyes of the Zombie and some pupils to the dude. This was pretty important for me at this stage to find the figures character fast. 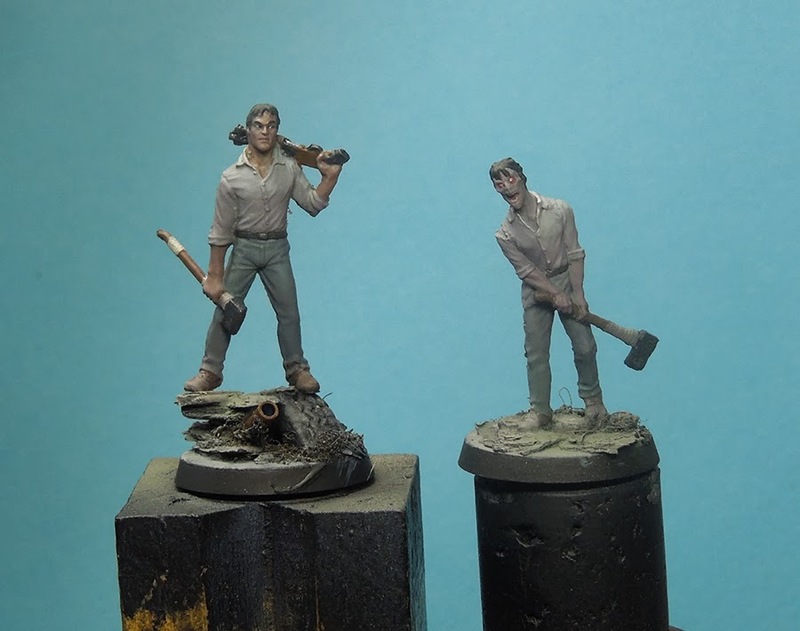 Article that brings you thoughts and examples on how you can paint eyes. Well, now I am in need of some darker contrast. So far all is basic tone with a little light sketch on the shirts. 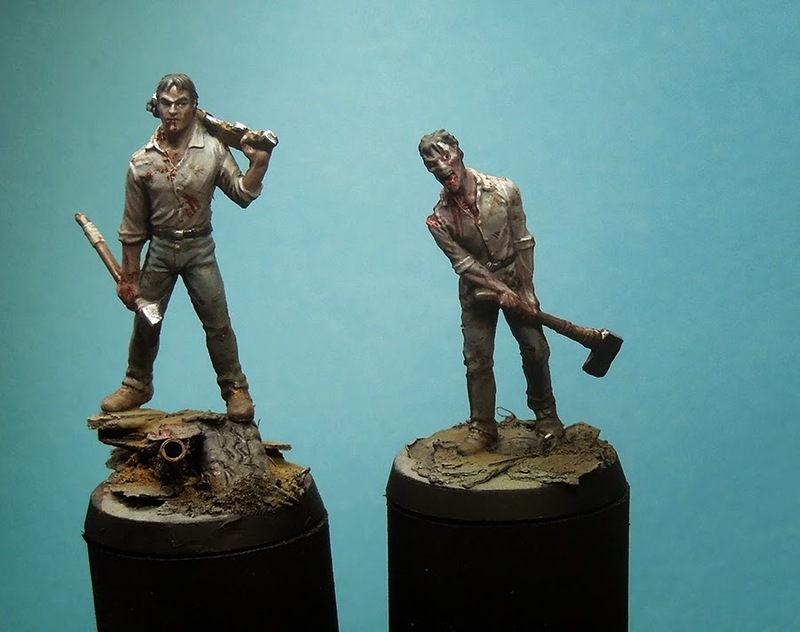 For gaming models I prefer using washes of several brands to achieve that quick. 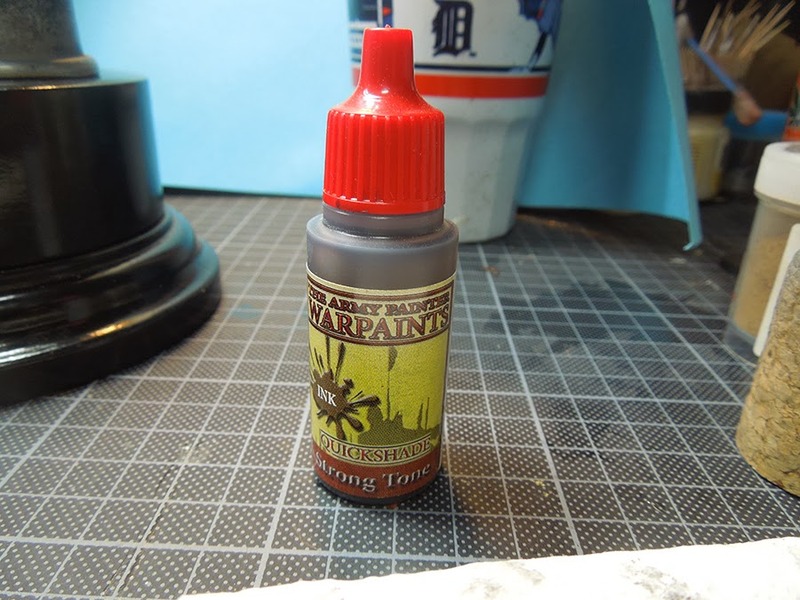 In this case I used one from Army Painter that I enjoy because of its matt finish when it is dry. Now comes the brain part where you have to think. I am paintign zenithal light now, I can use the basic tone that I applied already by using the wash mainly in the shadow areas. On the following example you can see what I am talking about. The shadows are more dirty/darker from the wash, his chest is kind of still basic tone and I got the light situation from my white sketch. 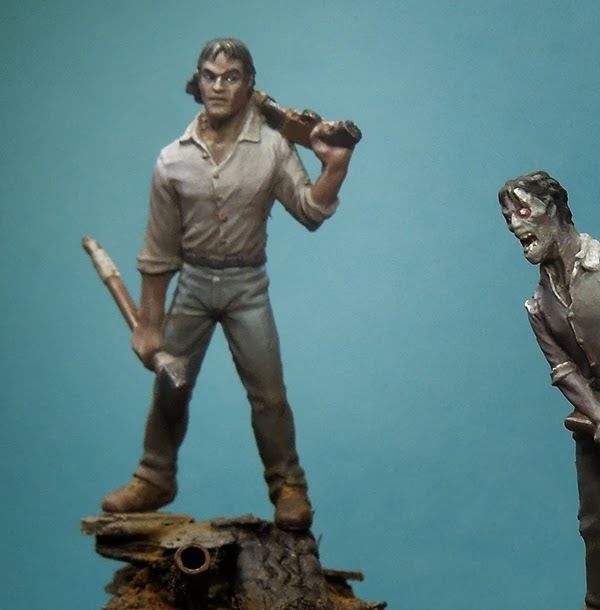 It all now comes together when you apply the wash. Make sure you understand the light situation of your model to apply it fast and well placed. It looks dirty here and there but I do not care as they are planned as quick gaming figures, maybe I should have taken more time to cut away mouldlines, eh? There are no extra lights painted so far, the light you see at the trouser, skin and the part of the shirt on the belly are just from the basic tone. Plow! Plow! Now the pure white zenithal light sketch I did to the white shirts look even more intese. There is the saying that a light only works with a shadow. Here you can see that too. Next I used some dark brown pigments to the bases to give it another colour overall. I also hit the feet and trousers sometimes, makes it all look dusty. The next step was adding some additinal lights, for example on the hair. I also cleaned up all the areas a little bit by using my basic tone again with a little additon of white, let's say a bright version of my basictones. I used them to intensify small lights on the trousers, on the shirt and skin. Last step is a pretty simpe one again. During Zombie Apocalypse I imagine eveybody pretty dirty with blood or mud or dust. Somehow I have this picture in my mind. So I went for some dirt and blood areas. I used these effects to alsso hide areas I did not like or to hide away evil mouldlines I did not clean properly first. 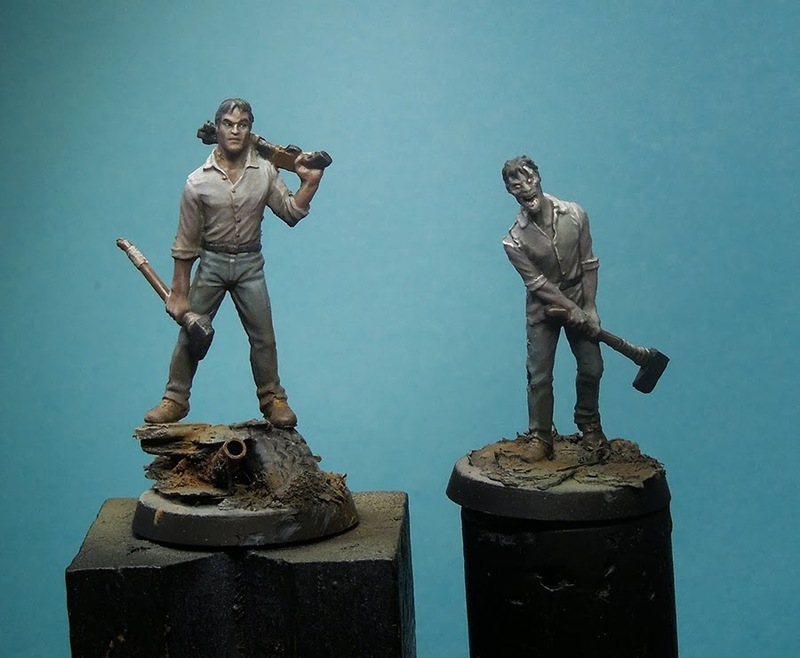 As said I wanted a quick paintjob and cleaning them during painting and repainting areas was no option at all. Gore time! 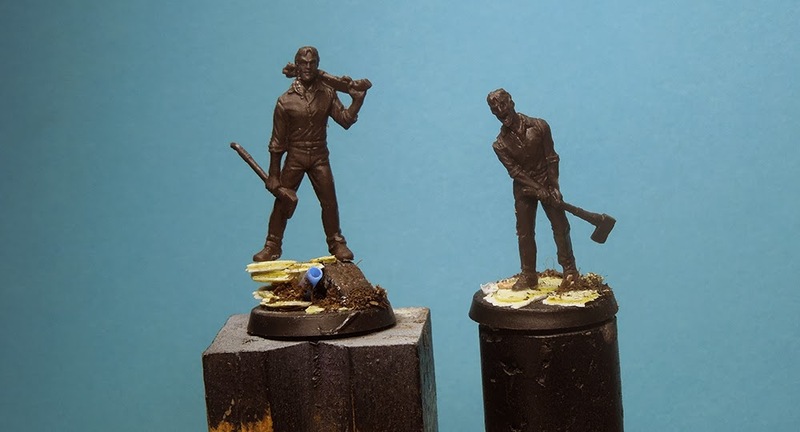 Well, painting the base edges black was the last step and the figures were ready to be placed among others. Ths time used on a pair of these was plus/minus 2,5 hours I would say - fine for quick gaming figures. 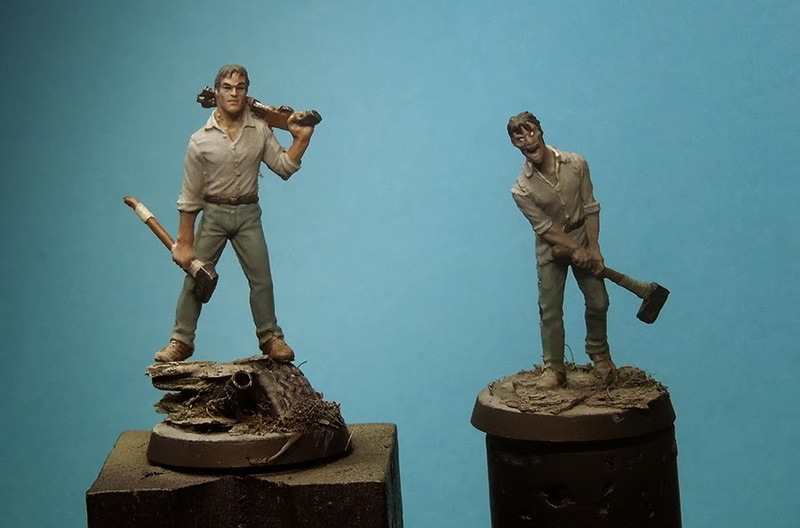 As you can see on the example with more figures I did put several more minutes in one or the other figure, always depending on the character and the details of the sculpt. 3. Placing the wash to add more contrast, if you place it all over the place it will look like there is no light situation going on at all. Think before you apply and use the help of zenithal light theory. Hope you liked the article! Let me know what you think and ask if there are questions! What colours did you use for metallics? For the metallics I went for Model Air's darkest silver tone on a black surface and a hihglight with Model Air silver ...Sorry, just forgot about that information. I haven't use AP quickshade ink yet. I imagine some old devland mud from GW would do the same trick, doesn't it? Love your work! 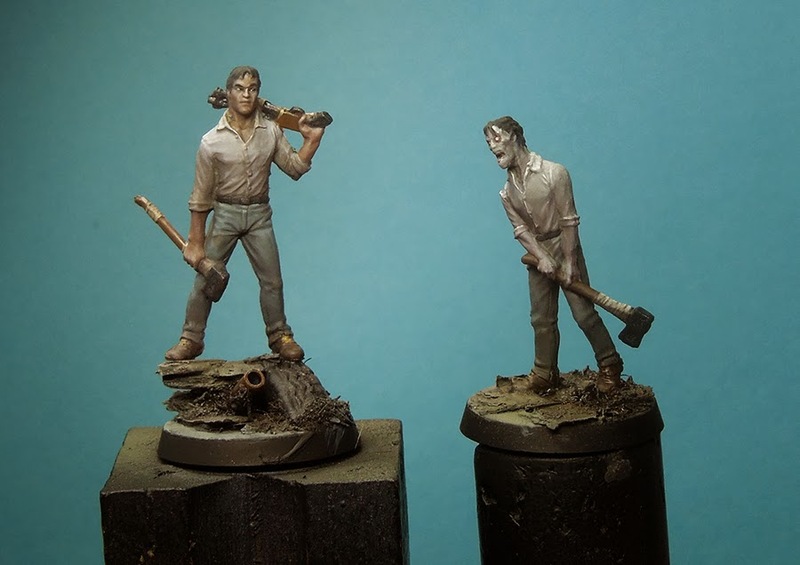 Love the fact that the 2 models you painted look like: One infected and the other a surviver, but with the paintjob they look like the same guy!